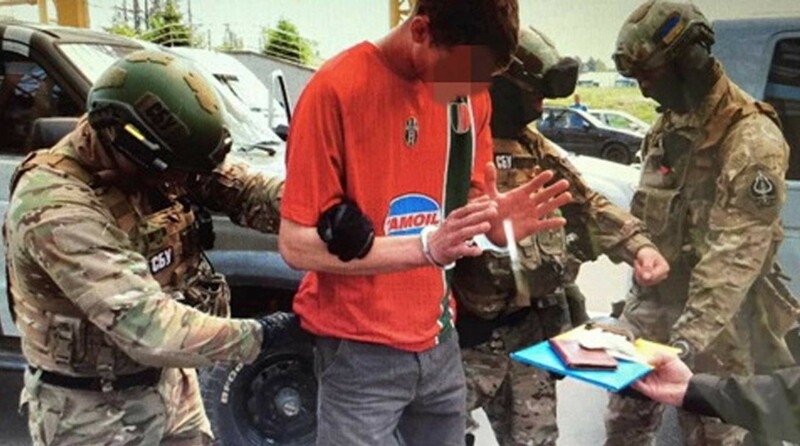 Ukrainian police have arrested a Frenchman who officials have alleged was plotting a string of terror attacks before and during Euro 2016. The 25-year-old man, who Ukraine’s state security service had been following since December, was discovered with an arsenal of weapons and explosives near Ukraine’s border with Poland, officers said. He had bought five Kalashnikov semi-automatic rifles and two anti-tank rocket-propelled grenades. Police also reportedly found in his car 5,000 bullets, 100 detonators and 125kg (275lb) of TNT, as well as balaclavas and other weapons. Officials said the man had far-right ultra-nationalist views and was planning to attack bridges, railways, synagogues and mosques, tax offices and motorways. A video made by Ukrainian security and posted on YouTube purportedly shows the man loading a white van with weapons before being dragged out of the vehicle by soldiers. French police said they had no evidence that the man had links with any terrorist groups. Ukraine’s state security service (SBU) said it first noticed him last December when he allegedly tried to “establish ties with Ukrainian troops under the guise of volunteering”. Ukraine is currently engaged in a conflict with Moscow-backed separatists in the east of the country.